All users in a particular company in Yandex.Connect are assigned to departments (or they are assigned to the general department All employees). A contact address (mailing list) is created automatically for each department. You can use this address to send email to all users in the department, or to quickly add them all to a group chat. But only the organization's admins can change the structure of departments. A name for the team. At least one team admin (by default, the person who created the team is the admin). The mailbox that will be used as the group email address. You can always access the lists of teams where you are an admin or a participant. 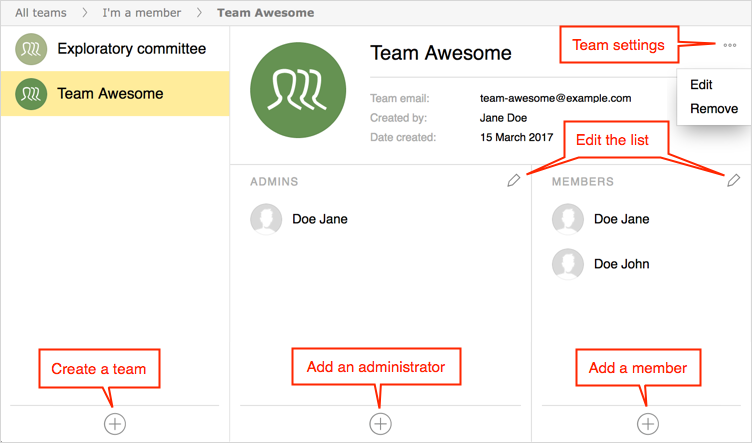 Unlike departments, each team must have at least one admin, who can manage participants, change team settings, and assign other admins. By default, the first admin is the person who created the team. Team participants can be individuals, or other teams or departments. Keep in mind that Yandex.Connect does not allow loops of nested teams. What this means is that if team A participates in team B, and team B participates in team C, then team C can't participate in team A.
Mailing lists that were created in Mail for Domain become teams when they are imported to Yandex.Connect. Only the company admin can assign the admin for this type of team.